The future waits for no one. In this new world, speed and efficiency are everything, and the populace zooms along in a perpetually stimulated haze. Angela thinks she’s the only person in her family maybe the only person on the planet who sees anything wrong with this picture. But the truth is she’s not alone. Angela finds herself recruited into a resistance movement where the key to rebellion is taking things slow. In their secret underground hideout, they create a life unplugged from the rapid-fire culture outside. Can they free the rest of the world before the powers that be shut down their utopian experiment? 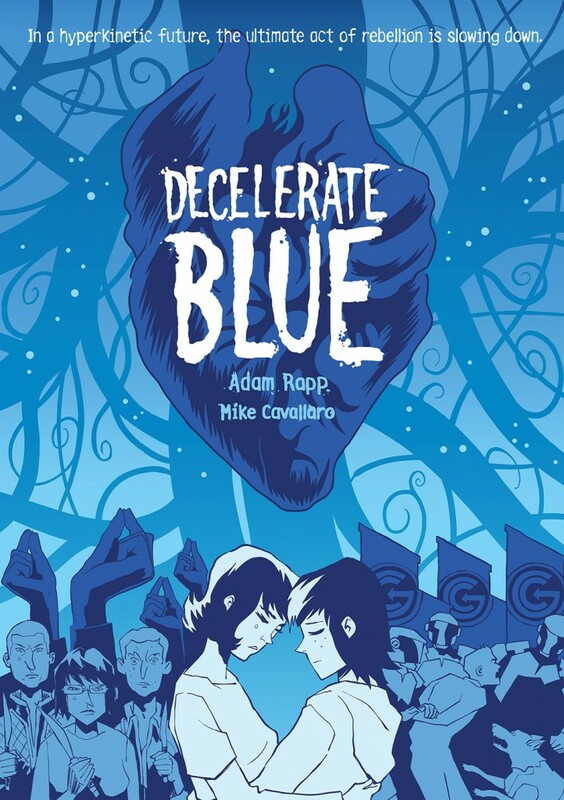 From revolutionary and award-winning playwright Adam Rapp and veteran cartoonist and animator Mike Cavallaro comes Decelerate Blue, a dark, breath-taking new vision of an all-too-plausible future for America. DECELERATE BLUE (First Second Books, 208p. $17.99. ISBN 9781596431096), a graphic novel by Adam Rapp and Mike Cavallaro, is now available for in-store and online purchase!